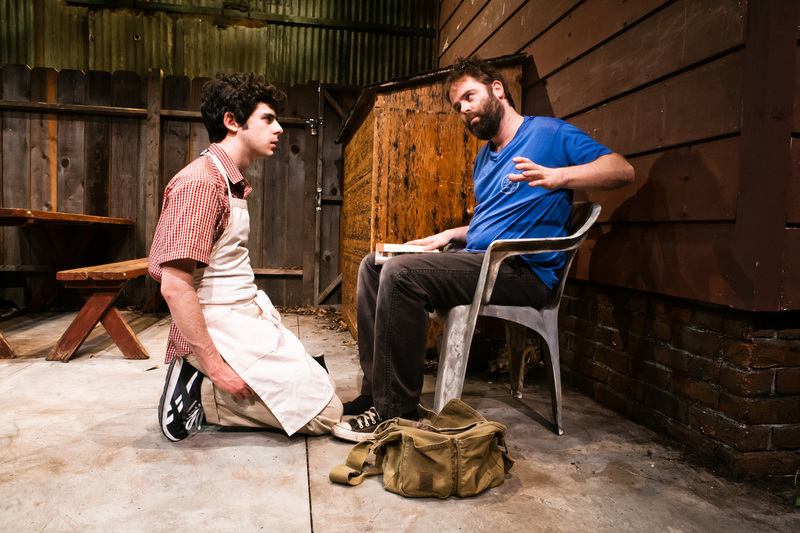 The Aliens by Annie Baker, directed by Lila Neugebauer. 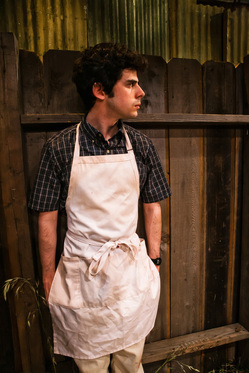 At the SF Playhouse (March 20th - May 5th, 2012) and the Studio Theatre (November 14th - December 23rd, 2012). 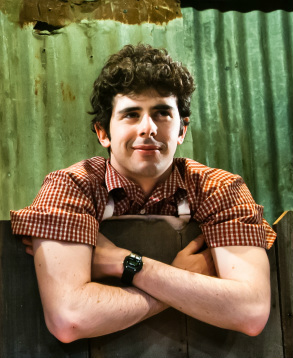 In 2012, Brian played Evan Shelmerdine in two critically acclaimed productions of Annie Baker's Obie-winning play, The Aliens, both directed by Lila Neugebauer. San Francisco and Washington, D.C. critics described Brian as "a revelation," "almost uncannily perfect," "completely present," "charismatic," "the standout performance," and "completely arresting," and credited him with "poker-faced perfection," "the acting chops of a veteran," "perfect comic timing", and "a rare, lackluster type of truth and beauty." Two angry young men sit behind a Vermont coffee shop and discuss music and Bukowski. When a lonely high-school student named Evan Shelmerdine arrives on the scene, they decide to teach him everything they know. A play with music about friendship, art, love and death. 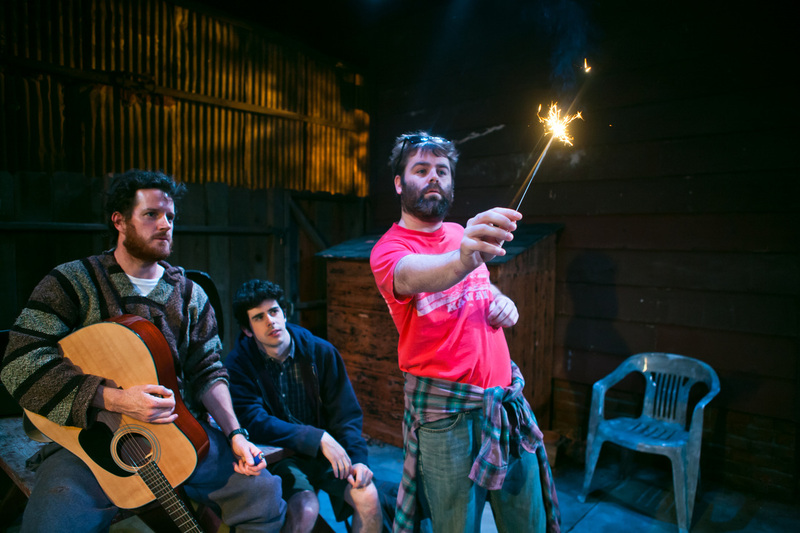 "Brian Miskell is charismatic as the shy, skinny and pathologically lonesome Evan. He looks like he is about 14 but has the acting chops of a veteran. This is a rare find in a young actor. He nails it all—the quaking voice, the caved-in chest and the longing eyes of a boy who desperately needs a friend." "The one character in transition is Evan…Miskell's Evan grows delightfully without losing his beguiling naivete." “An almost uncannily perfect Brian Miskell..."
"Miskell as Shelmerdine is a revelation ̶ so authentically awkward you can’t help but feel protective of him…Shelmerdine is responsible for a lot of the evening’s biggest laughs...(even his body language is funny), but he’s also got the greatest potential for pain and damage and other brutalities of reality." “The Aliens is all about the acting, and what a fantastic cast this production has…It is a rare treat to see three actors so intense and in such realistic banality..."
"The standout performance is by Brian Miskell as Evan. Through vocal tics, posture and jerky movements, Miskell creates a neurotic and uncertain teenager. Miskell is completely present as an actor, subtly reacting to everything happening onstage and modulating his speech so deliberately that the stutters really do seem spontaneous. Everything registers in his face and his body so that, even when the action isn’t centered on him, its effects on him are omnipresent and distinguishable." "The performances are extraordinary…more real than I could have imagined…"
"It’s rare to find actors so comfortable on stage." 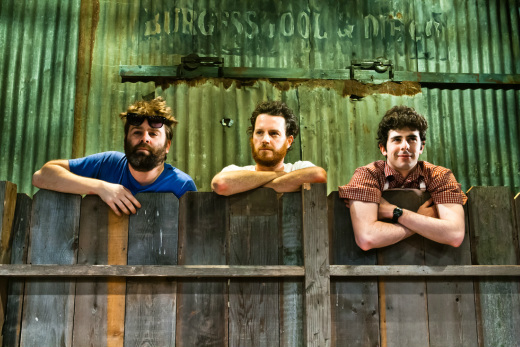 "The power dynamics between the characters, who are played with great precision and passion by the three-strong male cast, are completely arresting." "As he prepares to speak, Evan's head often moves cautiously forward, like a chicken that has spotted a seed of self confidence in its path. However, all it takes is one nagging phone call from his mother to transform Evan from a seemingly spineless teenager into a determined young man with a clear sense of boundaries..."
“Brian Miskell's portrait of Evan Shelmerdine is imbued with a rare, lackluster type of truth and beauty. Watching Miskell as he tries to appear cool and relaxed while self-consciously lighting one of his first cigarettes is a study in body language and dramatic pacing." “…a winningly eager and reticent Brian Miskell..."
"A cross between Jesse Eisenberg and Michael Cera, Brian Miskell masters awkward pauses and nervous 'ums'…Over the course of a few weeks, Evan dissolves some of his anxiousness — his eyes widen with energy, while he flattens his pubescent squeaks for a richer, more mature voice. 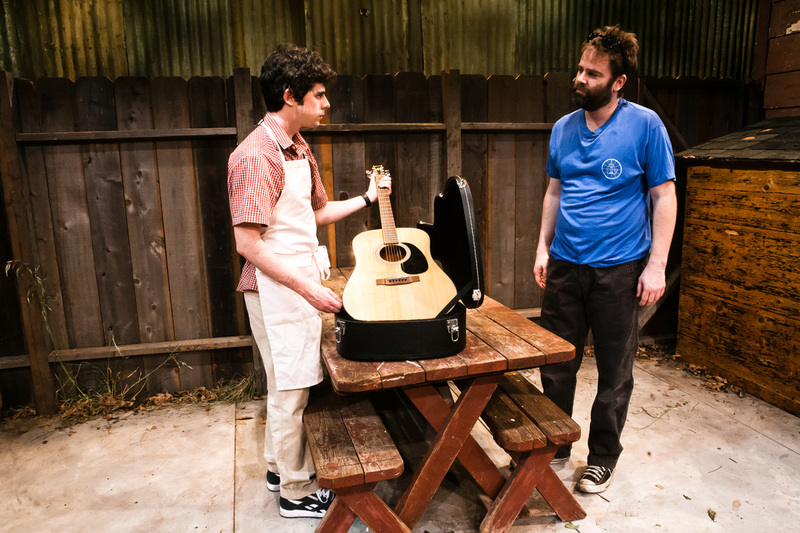 This 'coming of age' moment is illustrated at the play’s close, when KJ urged Evan to play the guitar and sing. Evan’s strums became stronger, his voice louder and sturdier as he played a hymn. KJ...beamed with watery eyes, as he said, 'You’ll go far.' "
"As he clumsily tries to find his way in the world, your heart can’t help but go out to him, and Miskell ably embodies the teenage angst that eats at him. 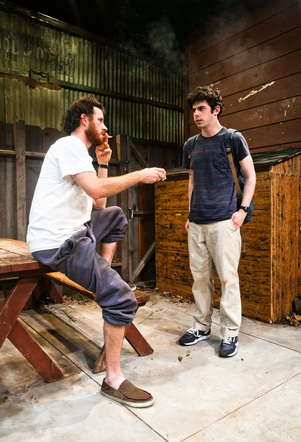 Initially an interloper...he becomes kind of the heart and soul of the play." 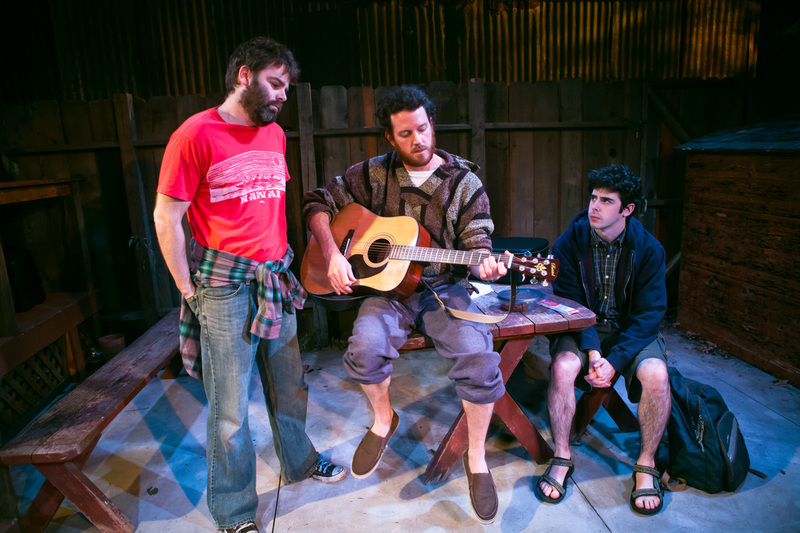 "The exploration of character here is painstakingly slow and gentle and utterly persuasive…The three actors are close to perfection...The line between actor and character is as invisible here as I’ve ever seen on the stage…I urge you to see this play. You will remember it forever."